How do I edit a group set in a course? Once you have created a group set, you can edit it at any time. 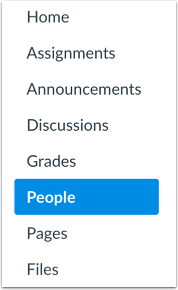 Editing a group set allows you to change the group set name, create self sign-up groups, and assign a student group leader. If self sign-up is allowed, you can also set or change the number of group members allowed in a group, but changing a member limit will apply to all groups in your group set. You can modify the limitations within an individual group, such as changing one group to allow a few more members than the other groups. 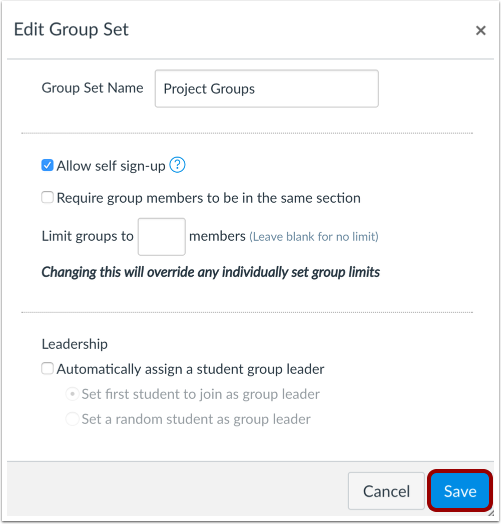 However, at a later time if you decide to edit the entire group set and change the group set limitations, Canvas will override all member limitations created within individual groups. In the group set, click the Options menu , then click the Edit link . Make edits as necessary to your group set. When you are finished, click the Save button. Previous Topic:How do I add a group set in a course? Next Topic:How do I automatically create groups in a group set? Table of Contents > Groups > How do I edit a group set in a course?